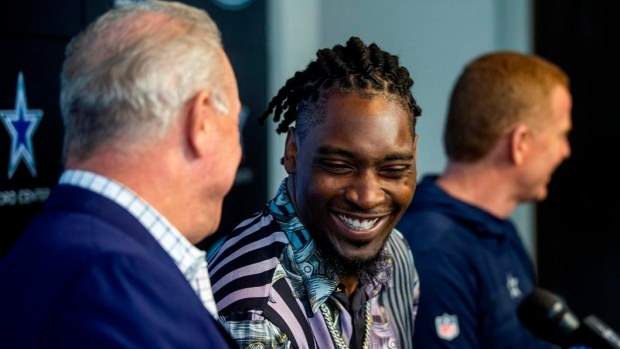 FRISCO, Texas — DeMarcus Lawrence may not be the highest-paid Dallas Cowboys player in history for long. Doesn't mean the club's best defensive end can't enjoy the distinction while it lasts. "It's hard for me to take it in. Going through the back surgeries and stuff, I thought my career was over. Before I even made a couple of sacks, I thought I would never see this day." Last year, Lawrence signed the $17.1 million franchise tag right away. This year, he wasn't going to grab $20.5 million guaranteed anytime soon, determined to get the long-term deal he felt he deserved. By not signing, Lawrence could have skipped mandatory minicamp without getting fined. "We were getting to a point where we needed to make it happen," executive vice-president of personnel Stephen Jones said of the surgery, joined by Garrett at the news conference while owner Jerry Jones made an opening speech over the phone from NFL labour meetings. "I think DeMarcus was aware of that too. I mean, he loves to play the game. Certainly, having that looming out there was probably important for both of us to really push and make the push we did there to get it done." The Cowboys have several young stars with paydays coming, headlined by quarterback Dak Prescott. Stephen Jones wasn't shy in suggesting that Prescott is likely to replace Lawrence whenever he signs. Prescott is in the final year of a rookie deal that pays the fourth-round pick $2 million. That's more than three times Prescott's salary from the 2016 NFL Offensive Rookie of the Year's second Pro Bowl season in 2018. "When you're getting ready to do a quarterback who is a franchise quarterback and already has put some serious skins on the wall like Dak has, no, he's probably not going to be there long," Stephen Jones said. "But he can always say he held the mantle, albeit it might be a short time." Three years into his career, Lawrence wasn't thinking about a big second contract. He had nine career sacks at that point, eight of them in his second season. The former Boise State player didn't have a sack as a rookie in 2014, and just one two years later as he battled those back issues, along with other ailments. Lawrence also had to serve a four-game suspension for violating the ban on performance-enhancers to start the 2016 season. Finally healthy and free of that cloud, Lawrence tied for second in the NFL with 14 1/2 sacks in 2017 and had another 10 1/2 last season. "The adversity he had early in his career and how he came back from that, a number of different times," Garrett said. "One of the great leaders on our defence ... who does things the right way and certainly a cornerstone player who we want to be here for a long, long time." Jerry Jones recalled the criticism he took when the Cowboys traded up 13 spots to the second pick of the second round of the 2014 draft "to take a player that we thought was the player left on the board that had the juice to get to the passer." "A lot of people thought we paid too much to get him," said Jones, who gave up his third-round pick that year. "Here we stand with a guy that's about to be the highest-paid player in the history of the Dallas Cowboys. He's earned it."